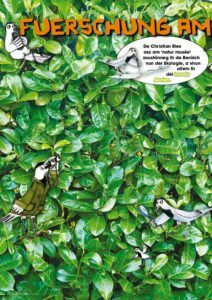 The last page of the article suggests the young readers to participate to a citizen science survey concerning the recent spread into the wild of the cherry laurel (Prunus laurocerasus L.), a common garden plant in Luxembourg, mostly planted to build hedges. Fruits can be dispersed over long distances by birds. Interested children are asked to look into the forests in their neighbourhood, the evergreen cherry laurel being very easy to spot in winter time, when trees and shrubs rejected their leaves. How many cherry laurel individuals have been spotted? Observers name, age, address and email address. Last updated on Monday, January 8, 2018. In autumn 2016 the Department for the Environment of the Luxembourg Ministry of sustainable development and infrastructures edited a leaflet in German and French about Ambrosia artemisiifolia, in co-operation with the National Museum of Natural History and efor-ersa ingénieurs-conseils. It can be downloaded here in PDF format (4 MB each). More information on the Common Ragweed in Luxembourg can be found in it’s dedicated article on this website. Last updated on Thursday, October 20, 2016.